I've written before about 45s from this interesting Louisiana label which put out 45s by the likes of George Perkins, Gloria Soul and Gene Kador. 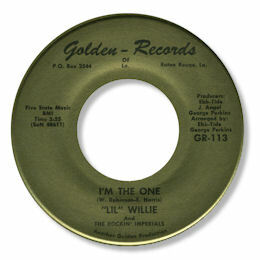 Li'l Willie (Robinson?) had two 45s on Golden both of which feature an excellent deep side. I'm The One" has some the problems of a small label production - a drummer unsure of the beat, out of tune horns - but does have the cardinal virtue of a singer who can really get you into a song. Willie's hoarse tone is just right for this sort of dead slow ballad, and I particularly like the short rap in the bridge and the way he cuts loose with some fine screaming after it and towards the run out groove. Tell Me Why" is even better - even if it probably was cut at the same sessions and has the same instrumental issues. The melody is structured better, Willie seems even more wailingly effective and the presence of a couple of girls in the background lends more weight to the production. I love the succession of chord changes after the bridge too. Note ~ There doesn't appear to be any link between this artist and this Little Willie here, or indeed this one here. UPDATE ~ DJ Arthur Gunn has kindly written with more info. 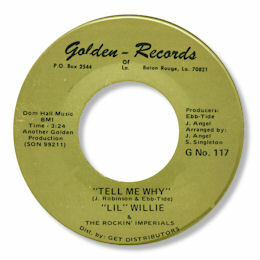 He writes "'Here's a brief history on Lil willie and the Rocks. The group was from Plaquemine, La. which is located on the mississippi river west banks approx. 10 miles south of baton, rouge la. This group start was a family band music wrote by local band teachers. the band went through about three generations before it disbanded and was very popular in the baton rouge areas along with a few others up and going groups." I'm very grateful to Arthur for getting in touch. Thanks to my friend Martin Goggin for the suggestion.